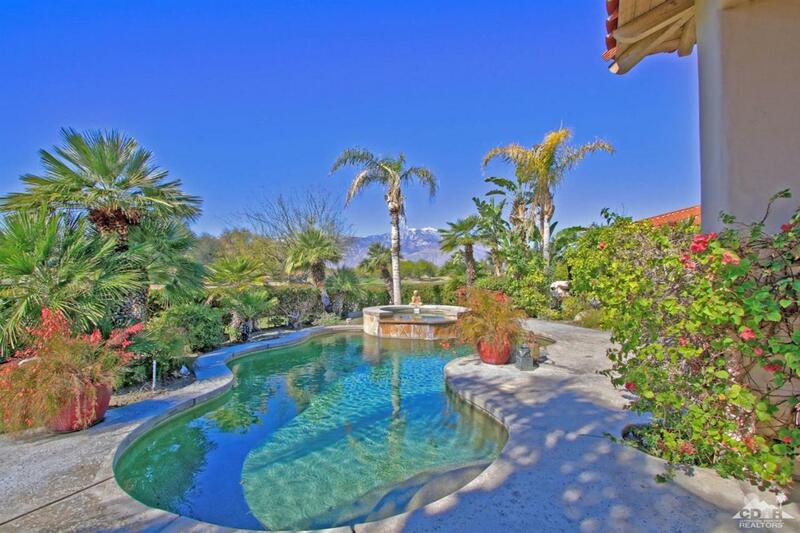 Highly Upgraded and Customized in Coveted Legacy at Mission Hills with Spectacular Southwest Views. Enter through custom gates to a courtyard with fountain and double glass door entry. A dramatic and elegant Great Room features travertine floors, fireplace, sunken bar and formal dining. An open Family Room and Gourmet Chef's Kitchen are great for casual desert living. Kitchen with granite countertops, stainless appliances, island and walk-in pantry. Family Room has custom built-in entertainment center and wall of glass with Views. Master Bedroom Suite with access to Pool Terrace, Spa-like Master Bath with Travertine Finishes. 2 Guestrooms with Ensuite Baths and a large Casita with fireplace and refreshment center. Outside are Covered Living Areas, Pool and Spa and expansive lawn all with stunning South and West Mountain and Pete Dye Fairway Views. Furniture Negotiable and Move-in Ready for your Season in the Sun!